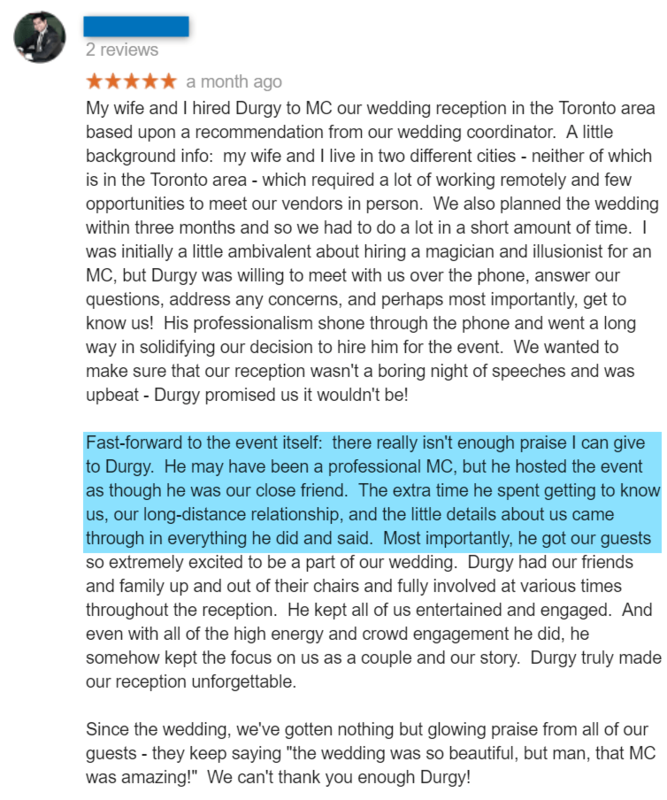 Why hire a Master of Ceremonies or a host? The truth is, from building guest lists and booking venues, to menu options and music selection, planning your special event takes a lot of time and effort. And whether you do it all yourself, or you hire an event planner, your goal is creating something magical your guests won’t soon forget. So when it comes to ensuring it all goes off without a hitch, hiring a Master of Ceremonies (MC) is the key to making sure all that hard work doesn’t come unraveled. Your MC is the glue that holds your night together. If you’re running behind schedule, ahead of schedule, or maybe one of your speakers or performers is just not yet ready, a well experienced MC will keep the night flowing without your guests ever realizing complications were raised behind the scenes. Your MC should work with you (or your event planner) to develop a comprehensive itinerary in order to help keep your event flowing smoothly and on schedule. 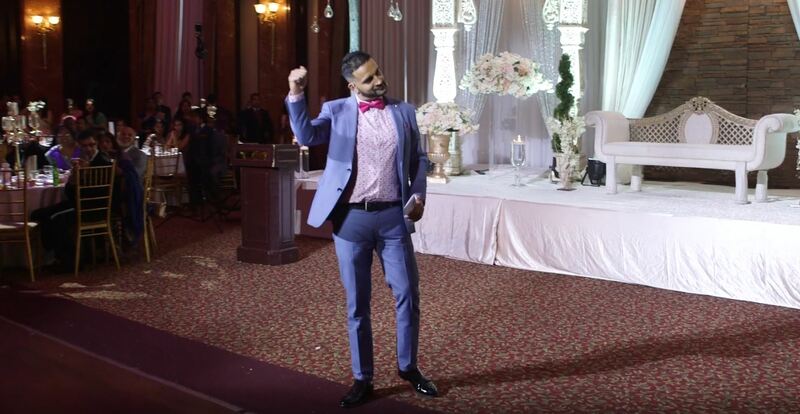 With a great MC, your guests won’t just be present, they’ll become part of the night! Of course they get the basics such as housekeeping notes, information on speakers or guests etc, but they also can expect to be playing games and taking part in activities that keeps them excited and pumped throughout the night. A MC or host with a special talent such as being able to perform magic and illusions is rare, but the lucky few who are able to book such an MC are in for a real treat. One of the biggest jobs of an MC is keeping your guests engaged and entertained. Attention spans can be short, and it’s easy to lose the crowd. Maybe dinner’s being served or a speaker’s running late, you can relax knowing your professional MC knows exactly how to combat extremely-long-speech-boredom, or couldn’t-care-less- power-point-presentation. They’re specialists in reviving waning weddings and humdrum holiday parties. This is where they shine! Being able to think quickly on their feet and get a feel for their audiences is what sets the professionals apart. Whether through comedy or a bit of magic, MCs are storytellers, often drawing on these skills when something inevitably goes off-script. While you might be secretly freaking out, you can be assured your MC has got your back, and your guests won’t notice a thing. This sounds good, but can’t my <brother/friend/colleague/dog> host the event? Unless the person is a professional speaker, the last thing you should consider is giving the burden of holding your evening together to a loved one. After going through everything that it takes to plan such an event, your guests should be able to relax, and enjoy the festivities – they shouldn’t be in attendance to work. They can and should certainly be involved when it comes to giving speeches and toasts. When it comes to setting the tone for the evening, bringing the energy level up to new heights, dealing with transitions between segments and attending to unexpected issues that may arise – leaving it to a professional is what will allow your event to have its own unique fingerprint. When you look back on your special day, you’ll be glad you went with a professional. Will bringing an outside party to host the event allow it to be personal? Absolutely! A minimum of one phone interview before the magical day, with the couple and the MC is recommended. This allows D. to learn tidbits of information that makes the couple stand out and unique. This also allows D. to learn about sensitive topics that should not be addressed during the special day. The interview process is included as a bonus for all couples making a booking. Ok, I’m convinced. What should I be looking for in an MC?